The Ardrossan Estate in Villanova. This is a story of the Main Line, that world of wealth and society, that fading memory. 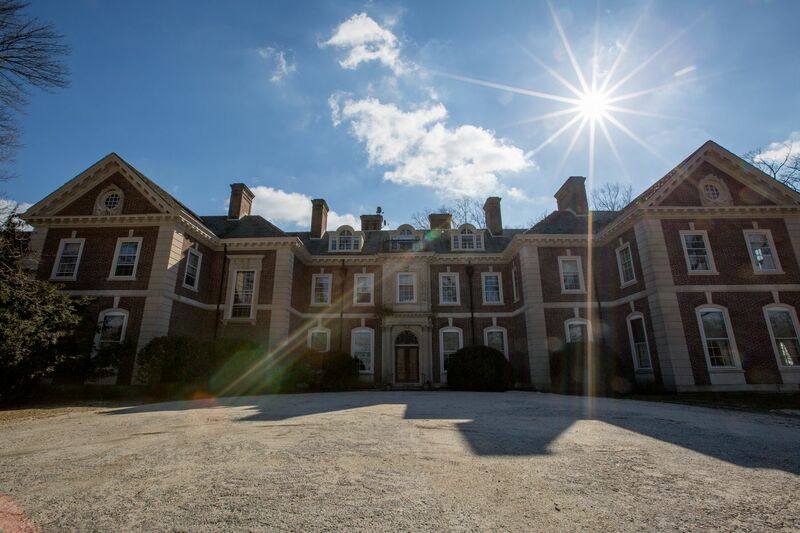 The writer was Robert Montgomery Scott (1929-2005) of the Montgomery/Scott clan that built and occupied Ardrossan, the Villanova estate with that still-astonishing (and endangered) 50-room mansion, last gem of its era, set on a glorious but shrinking parcel of land. This is the family who inspired The Philadelphia Story, people whose philanthropy, idiosyncrasies, and parties were legendary. Scott was a grandson of the creators of Ardrossan. His diaries tell of dissatisfaction with self and career, of alcoholism and marital breakdown. Robert Montgomery Scott as a young man. His reader was Janny Scott, who grew up on the Ardrossan estate from 1955 to 1969, when her father was appointed special assistant to the U.S. ambassador to Great Britain. A former reporter for the New York Times, Scott, 63, has written The Beneficiary: Fortune, Misfortune, and the Story of My Father. It reveals another side of this world of charmers and partiers. True to its subtitle, The Beneficiary concerns the ambiguities of inheritance. Scott brings that story to the Free Library in a free appearance on Monday, April 22. She spoke to us from her New York apartment about her father, his diaries, and how her family is receiving the revelations in her book. What was it like to be a kid growing up on Ardrossan? Janny Scott, author of "Beneficiary:Fortune, Misfortune, and the Story of My Father." Kind of fantastic. The family called the estate simply “the place,” such a plain-vanilla term, but it was extremely beautiful, on wide-open land not that far from Philadelphia, with wonderful old houses and barns. We were surrounded by my father’s family, which to a child was a wonderfully warm, colorful community. At the same time, I had a child’s obliviousness to how unusual it was. It was what we grew up with. Your discovery of the main trove of diaries is such a dramatic moment. My father had promised me his diaries when I was in my 20s, saying he wanted me to have them when he died. I found my father mysterious, wanted to understand him better, and this offer, which came out of the blue, was both flattering and of great interest. “Why me?” I asked. He said, “You’re the writer.” We never mentioned it again. When I got interested in this book project, I received some diaries from my father’s girlfriend, and eventually I stumbled upon the rest. He had chosen to leave them in a wooden chest with a padlock. It had a combination everyone in the family knew, and he’d left the padlock one digit off, so it was easy to open, even inviting. I read the first pages of the first diary and was blown away by his sensitivity to his situation and character. I carted them all back to my apartment in New York and read them over a period of months. “You’re the writer” — was he suggesting you write about his story? Mr. and Mrs. Edgar Scott at their Ardrossan estate near Villanova. It’s ambiguous. It could mean, “You might want to do something with this” or, “You’re the only one who’d be interested.” It’s an offhand answer, and our little talk was strangely flippant on both of our parts, considering the gravity of what was being offered. People might question whether using the diaries in the book was the right thing to do. But because my father had offered them to me for the reason he stated, I didn’t feel the degree of qualms one might have about reading a parent’s intimate account of his private life. How does the rest of the family feel about the book? I don’t know yet entirely. People were wonderfully open in talking to me. They let me subject them to repeated interrogations. I was really touched when they agreed to speak to me, even early, when I wasn’t sure where the project was headed. I showed the manuscript to my mother, my siblings, and my father’s brother, who were closest to my father. While there was much in the book that was surprising to them, they did not object to things, did not try to stop me. My uncle [Edgar Scott Jr., now 93] was surprised by the degree of my father’s distress, that he had not seen that in my father. My father certainly did not make it very visible; he was a seemingly jovial, gregarious soul. That inner turmoil was surprising to my uncle. My siblings and mother had lived through a lot of this and so were less surprised. But they, too, were struck by the confessional, painful quality of the diaries. One thing that surprised us all was that my father’s awareness of his alcoholism began very early, in his 20s, and he struggled with it for decades, in ways we didn’t see. When we eventually raised the subject of his drinking with him, he’d deny he had a problem. How old were you when you realized it? The Scott family. (Left to right:) Back row: Odille Nadeau (nanny), Robert Montgomery Scott, and Gay Scott. Front row: Janny Scott, Elliot Scott, and Hope Scott. As a teenager, it became pretty clear to me. Drinking was not unusual in that era and that place. I don’t remember hearing much about people who didn’t drink – that would have been like hearing that someone didn’t use soap. I was aware, yes, that father drank a lot. But many did, and attitudes were different. People say that even the term alcoholic was fairly uncommon back then. I have to think this process has been painful for you, too. I feel much greater empathy for him than I did before. I was so in the dark about the forces he was wrestling with. The painful self-scrutiny there is also painful to read. And, I confess, I was deeply frustrated by my father’s inability to avoid the fate [fatal cirrhosis] he succumbed to. This was a very moving exercise in getting a handle on the demons that haunted him. I also now have a much more detailed understanding of the family history and how it plays out in generations, how the economic successes of the 19th and early 20th centuries shaped choices subsequent generations made. What about the big house at Ardrossan? What of its future? I have mixed feelings. My father cared deeply about it, and he devoted the last decade of his life to restoring it to absolutely original perfection, with a staggering, bewildering meticulousness. But it’s not clear what the possible use of Ardrossan is now, and the family does not have the cash to subsidize something like that indefinitely. It involves a lot of emotions. I do not live there and am perhaps a little more detached than some others, but even now, even for me, the place, the land in particular, is achingly beautiful. I understand the way it resonates in various family members’ minds and hearts. 7:30 p.m., April 22. Parkway Central Library, Free Library of Philadelphia, 1901 Vine St. Free. Information: 215-567-4341, freelibrary.org.